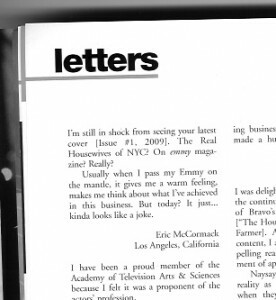 Read Eric McCormack’s letter to Emmy magazine (the magazine for Emmy members). I’m still in shock from seeing your latest cover [Issue #1, 2009]. The Real Housewives of NYC? On emmy magazine? Really? Usually when I pass my Emmy on the mantle, it gives me a warm feeling, makes me think about what I’ve achieved in this business. But today? It just… kinda looks like a joke. How much do I love that man? It takes a brass set to say something like that in this town. Eric McCormack, I hope you have gazillion more hit shows. Hollywood needs you. Also, the Motherhood. It falls flat, and it looks like it’s on it’s way to being cancelled. I think I can tell you why. Moms escaping their kids are only funny when they love their kids. If you want a funny show about motherhood, go to Roseanne. In the Motherhood fails because they clearly aren’t in on the joke, hating your job as a mother isn’t funny. In The Motherhood should have been great, unfortunately it comes off as cruel and mocking and when I watch it, I try to remember that the stars of the show are not to blame for their hideous parodies of motherhood. Writers, show the women kissing their kids just once, or cradling them… give me just one empathetic moment and prove that you don’t hate the moms. Nothing like cheapening an Emmy…Especially in this economy. yes in the motherhood was very disappointing. i wrote a post about the HOPE of it at NJMoms …oh well. maybe us bloggers could do it better. Motherhood made me squirm. Had to turn it off when baby was crying and she was locked out. Was that supposed to be funny???? real housewives of anywhere is like staring at the accident. period. i missed in the motherhood but sounds as if it missed the mark. too bad. i agree, there is PLENTY of humor in parenting. but is the love your kids part not the obvious? I am also very disappointed in In the Motherhood. I was really looking forward to it, too! It would have been nice if the producers of In the Motherhood (which started out on the web) had tried hiring mom bloggers for staff instead of just appropriating their stories. Can you imagine how much more fun (and funny) the show would be with the voices of people like Mindy Roberts or Busy Mom or Rebecca Woolf? As for Eric McCormack – he totally rocks. In total agreement with Donna- I was shocked at the commercials for In the Motherhood with situations I had read about WORD FOR WORD on some of my favorite blogs.